A bachelor's in business administration degree provides students with a foundational background in business principles. Students can expect to cover introductory and intermediate material in accounting, finance, marketing, management, human resources, and many other subfields in business. Online bachelor's in business administration programs afford distance learners the opportunity to balance the demands of work and family while earning their business degree. The broad skills that you'll learn in school prepare you to work in a number of industries, and specializations within the program can help you earn introductory positions in a variety of roles. Graduates often find work as managers, supervisors, and administrators in sectors as diverse as banks and human resources departments. While it's tempting to seek out the cheapest online business administration programs, it's important to distinguish between a cheap and affordable. A cheap program offers low tuition; an affordable online business administration program offers value. It combines inexpensive tuition with a robust curriculum, high graduation rates, low student loan default rates, and positive employment outcomes. 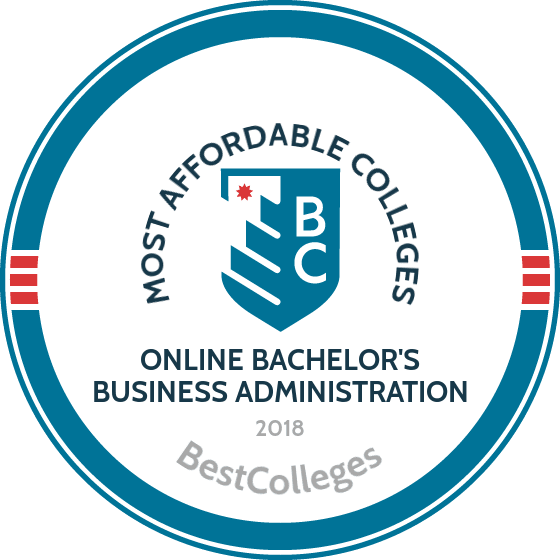 Below, we've ranked the 25 most affordable online bachelor's in business administration programs in the country. Factoring in a number of metrics, our College Affordability Score has identified the top online programs in the field. If you're considering going back to school for a business administration degree, and are interested in the online format, be sure to give our list of schools a look. Brigham Young’s BS in business management with a concentration in entrepreneurial management requires students to earn 120 credits, including 54 major and 26 elective credits. Business core classes cover a wide range of business and finance fundamentals, including production and operations management, business strategy, and principles and problems in micro and macroeconomics. Entrepreneurial courses like small business creation and financing new ventures prepare business owners to plan, launch, manage, and grow their startups. Students applying to the BYU online business degree should have completed a minimum of 15 on-campus hours from a Church Educational System school like BYU and Ricks College. A second option is to enroll in a one-year or three-semester pathway program through BYU that prepares students to succeed in college. Additional admission requirements include a minimum 2.5 GPA in all previous college coursework. Applications are accepted at four points throughout the year, and students can start during any semester. UF offers a BA or a BS in business administration, both prepare students for careers in a range of business fields, including marketing, economics, and business law. Graduates are equipped with the skills necessary to develop, implement, and effectively oversee business projects and departments. The curriculum emphasizes the development of strategies for business improvement, effective and ethical business practices, and knowledge of global market trends. The BS program focuses on the technical and functional aspects of running a business, with courses in business communications and career management. Students interested in learning the foundations of business as a prerequisite for a more specialized career should consider the BA. The BA option offers eight specializations, including educational studies, geology, sport management, and anthropology. Both degrees require an internship. Transfer applicants must have earned at least 60 college credits and an overall minimum 2.0 GPA. Transfer students must have also completed seven basic prerequisite courses, including calculus and introduction to statistics, with a minimum 3.0 GPA in each course. The BSBA in general management from Thomas Edison State requires students to earn at least 120 credits. Learners must study at least three of the four foundational business areas: management, finance, accounting, and marketing. The curriculum blends general education requirements in communication, civic learning, mathematics, and the sciences with business courses like international management, computer concepts and applications, and managerial communications. The advanced courses include 18 credits in the foundational business subjects, with an additional six credits in business electives. All students are encouraged to choose a business ethics course as part of their study plan. A streamlined online application requires submission of official college and military transcripts. Credit can be earned for passing college-level examination programs, earned licenses and certifications, and the completion of American Council on Education and National CCRS-approved professional training programs. This affordable business degree online offers a per-credit tuition plan, which allows students to pay as they complete each course. South Florida Bible College’s BA in business management curriculum blends business administration and management courses with topics in the Bible and theology. Students learn about leadership and business fundamentals through courses in organizational behavior, economics and the manager, and case studies in leadership. Learners also complete two courses in ethics. South Florida Bible College describes its courses as non-denominational and an expansion of any Christian faith. Students can transfer up to 72 credits. All admission requirements for this online business bachelor’s degree, including college transcripts, should be submitted four weeks before the desired starting term. Courses are taught in an accelerated semester format, allowing distance learners to complete their degree quicker than on-campus students. Qualified learners can work with an advisor to discuss options for earning credit for life experiences. Online students pay an additional fee for each online course, but the per-credit tuition rate is the same for all individuals, including international students. Distance learners must fulfill 40 hours of annual Christian service. Students enrolled in UIC’s online BBA completion program complete 61 credits in general education, core, and elective requirements. Business and management courses include introduction to marketing, introduction to managerial accounting, and operations management. A range of electives allow students to customize their curriculum according to individual goals and interests, with classes like business law and entrepreneurial finance. The program is taught through a cohort format, requiring a group of students to move through the program at the same pace. Most courses, except the two final course requirements that last 12 weeks, are structured in accelerated, eight-week terms. The program helps students develop the skills needed to work in a fast-paced economy that's affected by globalization and advancing technology. UIC’s Business Career Center also helps connect students with internship and job opportunities. In order to apply for UIC’s business degree online, applicants must have completed 60 hours of post-secondary core and general education coursework. Saint Joseph's BS in organizational management provides the foundation that business leaders need to understand the structure of business organizations and make better strategic decisions. The bachelor's, one of the best online business degrees, is geared towards supervisors and managers with prior business experience. The curriculum requires students to earn at least 120 credits, including 35 credits of liberal arts electives and 33 credits of other electives. The business elective courses focus on ethics, computer applications, and other professional skills, like problem solving. Essential business courses span a broad range of subject areas, including business programming, principles of training and staff development, and process of management. Students also complete a final capstone research project in organizational management. Admission requirements for starting freshmen include SAT or ACT scores, two letters of recommendation, and a personal statement. Students should have completed four years of college prep mathematics courses. The bachelor's in business and management from Excelsior is designed for graduates of associate programs in business management and for military veterans and Department of Defense civilians whose roles involved management and business-oriented duties. Graduates are equipped with skills that are essential for all business leaders, including communications and project management skills, knowledge of business computer technology, and an understanding of the global business landscape. Students complete 120 credits in the arts and sciences, business, and upper-level electives. A capstone in integrated business and management assessment is required. For transfer students, any qualifying credits must have been earned within 15 years of the enrollment date. Students may be able to fulfill business administration degree online credit requirements by completing UExcel, Excelsior’s college examination program. Once accepted into the program, students have six months to formally register for courses. University of Illinois’ BBA offers two learning options: BBA comprehensive and management concentration. The comprehensive is designed for students seeking a broad education, with course topics in finance, marketing, management, and operations management. The management concentration teaches the conceptual and interpersonal skills that students need for such positions. Both options have similar requirements. Students receive a broad education in fundamental business concepts, including finance and operations management. The 120-hour curriculum begins with foundational courses that include statistics and economics, then moves into business core and upper-division major requirements. Students are required to complete a capstone project. A minimum 2.0 GPA must be earned in all courses. All students admitted to UIS’ affordable online business degree pay the same tuition rate. Full-time students who have met all foundational requirements can complete the degree in two years. The BA in business administration from Governors State prepares graduates for new and mid-level careers in business and administrative roles. Completion of a liberal arts-style foundation is followed by business major requirements that span topics in finance, management, and economics. Supporting courses include basics of information technology, business ethics and social responsibility, and finite mathematics or applied calculus. Students can choose from one of seven concentrations: management information systems, finance, human resources, marketing, operations and supply chain management, entrepreneurship, or marketing. Applicants who have completed 25 or more college credit hours and earned a 2.0 or higher GPA are considered transfer students. Transfer students with up to 44 credits must first apply to the university as an undecided major. Freshmen admission requirements include at an unweighted 2.75 GPA, qualifying SAT or ACT scores, and a high school diploma. Students can apply in the fall or spring, with applications received after the preferred deadline reviewed on a rolling basis. Charter Oak's BS in business administration requires students to earn at least 45 qualifying college credits through the school. Students learn a diverse set of business and organizational skills that can be applied to a business, nonprofit, or governmental environment. Graduates are expected to have a firm understanding of business IT, political and social influences on the global marketplace, how to apply teamwork and motivational skills as a leader, and more. The 120-credit curriculum includes liberal arts, general education, business major, and elective requirements. Prerequisites include macro and microeconomics and business statistics. Eligible students can transfer up to 87 credits from an associate degree or community college. Charter Oak also accepts credits earned through college-level exams and ACE-evaluated military credits. All students must complete a beginning cornerstone seminar and a culminating capstone project to graduate with their online bachelor’s degree in business. FIU’s BBA in management introduces students to the foundations of business management, including information systems, strategic management, and the legal environment of various organizations. The 120-credit curriculum is divided into 60 credits of lower-division and business pre-core classes, like statistics for business and economics and principles of macroeconomics, and 60 credits of upper-division coursework that includes advanced communication for business and operations management. The program emphasizes the understanding of how organizations affect and are affected by the community, as well as understanding the ways in which organizations are organized and function. Students choose 12 business electives in an area that aligns with career goals or interests. Applications can be submitted for program start dates in the fall, summer, and spring. First-time college students must submit official high school transcripts and recent SAT or ACT scores. Transfer students are waived from needing to submit college-entrance exam scores. Online students are eligible for a range of institutional scholarships, and Florida residents may also qualify for state-based scholarships. The BBA in management from UH-Victoria exposes students to a range of fundamental business topics, including ethics, leadership, and change management. Students are required to complete at least 120 credits. Some general education or core courses may only be offered on campus. The upper-level business core covers a broad range of topics, including finance, marketing, and organizational information systems. Concentration-specific courses focus on human resources, international management, organizational behavior, and change. The concentration requires students to complete nine hours of select business and management courses that fit their interests. Students applying with less than 12 college credits must provide an official high school transcript; learners with more than 12 hours should provide all college transcripts. International students who can provide qualifying English proficiency exam scores are encouraged to apply. Students enrolled in Golden Gate’s BA in management program learn the real-world skills necessary for success in the public and private sectors. Students choose between 10 concentrations, which include public administration and information technology. Students have access to career counselors to help guide their career path. Graduates are able to assess an organization’s informational needs and effectively apply research tools, including data analysis, to help determine best solutions. This affordable online business degree offers the same tuition for each three-credit course to all distance learners. For direct enrollment, students must have at least 12 transferable undergraduate credits with a minimum 2.0 GPA. Freshmen applicants must provide a high school transcript with a GPA of 3.0 or better, a resumé with at least three years of professional experience, and a professional statement that outlines career goals. Some applicants may be required to complete an in-person or telephone interview. The BS in business management from CSU provides learning opportunities that allow students to develop skillsets that include providing client recommendations based on financial data analysis and hiring employees. Students learn the integrative functions of managing a business in a global economy. The 120-credit curriculum includes 12, three-credit major courses, including information systems design and management and quantitative business analysis. Students interested in customizing their degree can choose from one of 21 concentrations, each requiring an additional 15 credits, including criminology, nonprofit management, and small business and entrepreneurship. Students can earn skills-based awards of completion in managing business fundamentals in the global marketplace and applied strategic management. They are valuable credentials for earning a promotion or applying for job openings. Admissions for CSU-Global’s online business degree include at least 12 transferable college credits with a minimum cumulative GPA of 2.30. Rutgers’ BA in business administration provides a broad foundation of business skills that can be applied in a variety of business careers, including financial services and human resources. Students interested in a specialized track can choose an optional concentration in either general management or hospitality management. Accredited by the Association to Advance Collegiate Schools of Business, the online business bachelor's degree offers multiple start dates during the year to accommodate the schedules of working adults. Students gain opportunities to expand their business network by attending virtual classes with peers from various industries and levels of experience. Taking a full-time course load enables most students to complete all degree requirements within two years. Program admission requires the transfer of at least 12 post-secondary credits, a minimum GPA of 2.5, official college transcripts, and the completion of foundational English courses with a grade of "C" or better. Bellevue offers a BS in business administration that provides interactive experiences to help students develop communication, decision-making, and other leadership skills. Graduates have a foundational knowledge of business law and organizational systems. Students learn how to execute marketing plans and apply research to determine best-fit solutions. The 127-credit curriculum blends general education and the Kirkpatrick signature series of courses, which focus on the intellectual and cultural evolution of western civilization, along with elective and major coursework. Business courses include introduction to management science and managing operations in a changing economy. Students can choose an optional nine-credit emphasis in accounting, finance, human resources, international management, or marketing. Bellevue’s affordable business degree online features a basic per-credit tuition rate that is the same for all distance learners, with discounted rates for active military members. Transfer students must complete at least 30 hours through Bellevue in order to earn a degree. ASU's BS in organizational management requires the completion of 120 credits or 41 classes, which are structured in accelerated seven-and-a-half week terms. Course content focuses on the global economy and eCommerce, strategic management, and effective hiring and team-building skills. Classes include cross-cultural management and leading organizations. Coursework blends real-world team projects with individual skills-based activities and analysis of case studies. Graduates are prepared for entry-level supervisory positions within a range of organizations, including manufacturing companies and nonprofits. Students must complete at least 30 hours through ASU and maintain a 2.0 cumulative GPA to earn their degree. Application for the business program requires that students have completed at least 30 undergraduate credits, unless a freshmen student can provide qualifying SAT or ACT scores or a minimum high school GPA of at least 3.6. Transfer students do not have to submit entrance exam scores if they have a cumulative 3.0 GPA in all undergraduate coursework and an unweighted high school GPA of at least 3.6. Students who do not meet these requirements can still submit an admissions portfolio, with preference given to students who have at least a 3.0 ASU or transfer GPA. Appalachian’s BSBA in management is one of the most affordable degree options for North Carolina residents. Students can choose to enroll part-time or full-time. The average completion time is two to four years. In order to qualify for the 122-credit program, students must transfer at least 70 qualifying credits, with a minimum 2.0 GPA, in general education subjects that include principles of economics and business mathematics with calculus. Application deadlines are offered in the fall and spring. Students must maintain a 2.5 GPA to earn their degree. Graduates of the business management program are well-versed in team dynamics and retaining valuable employees, and also leave with the leadership skills necessary for navigating an evolving global economy. Applicants who want to stay up-to-date on deadlines and event invites can sign up for an AppConnect account through the university. WGU offers a competency-based BS in business management, specifically designed for nontraditional students in an online environment. The online business management curriculum is created with feedback from industry leaders who serve on a business program council. Core subject or general education assessments, which include English composition, survey of United State history, and other courses based in the sciences and humanities, can be waived with qualifying transfer credit. The 120 required competency units, equivalent to course credits, cover a diverse range of business basics, including economics, spreadsheets, business law, and ethics. A culminating written capstone project allows students to apply learned knowledge toward creating a solution in a current place of business or another area of interest within a modern business environment. Students should have at least 15 hours per week that can be dedicated to study. The average completion time for students who apply with an associate degree is two years, while first-time students take about four years. The completion of courses is based on passing assessments; students can complete classes at their own pace and can complete most courses in any order. Students enrolled in UH’s BA in business administration choose between seven concentrations: hospitality and tourism, facilities management, marketing, general business, management, accounting, or finance. All students complete foundational business classes and complete a final capstone, which can be a senior project or site-based practicum. UH maintains local partnerships for each of its concentrations, such as the Honolulu Department of Facility Maintenance for the facilities management emphasis. These partners also serve as curriculum advisors, providing perspective on emerging trends and current industry workforce needs for each major. Applications are accepted at three different points during the year, with admission for the following semester. Students who have completed less than 24 transferable credits are classified as freshmen. Learners who have already earned an associate degree are not required to complete additional general education requirements. Tuition rates for online programs are the same for on-campus programs. UM’s BS in management offers a fully online experience through the Crookston campus. Coursework offers students the opportunity to develop evolving 21st-century skills in entrepreneurship, technology applications, and collaborative teamwork. Graduates are prepared to enter a variety of positions within businesses, government organizations, and nonprofit institutions. Students must earn at least 120 credits, which includes 50 credits of major courses like change, creativity, and innovation management and introduction to small business and entrepreneurship. A competitive per-credit tuition rate is offered to all online learners in UM’s online business bachelor’s degree. Students who meet the following admissions requirements are automatically admitted to the college: a high school diploma or equivalent with a minimum 2.0 GPA and qualifying SAT or ACT scores. Applicants who do not meet minimum requirements can still apply, with further consideration given to extracurricular activities, a history of improvement in academic performance, and/or evidence of outstanding personal achievements in or outside of school. Athens’ BS in management offers 15 business-related minors, including aviation management, international business, healthcare management, information systems management, and operations management. Graduates are equipped with critical thinking skills, an understanding of cultural differences, and communication acumen, which prepares them for mid- and upper-level management roles. The 72-credit curriculum includes a mix of lower-division, upper-division, and major-specific courses. A strategic management capstone course is required for all business majors. Athens' distance learning portal offers access to classes through Blackboard, as well as career services, an online writing center, a virtual library, financial planning tools, and more. In order to qualify for admission into the business administration degree online programs, students must have completed 12 transferable, college-level credits and provide official transcripts from all colleges. Students can also earn credit for past military experience. Per-credit tuition discounts are offered to active military members and their spouses. Brandman University’s BBA covers a broad range of business fundamentals, including accounting, global business, and management information systems. Online courses are accessed through the Blackboard learning management system. Since 2014, Brandman has been a member of the Quality Matters program, an internationally-recognized set of standards for designing online courses. Distance learners have access to a dedicated technology help desk. A variety of minors are available, including contract management, human resource management, and international business. Students must complete at least 124 credits, including 50 professional course requirements in topics that include money and banking, management of change, and labor/management relationships. The curriculum includes a final senior seminar and capstone project. All online students are offered competitive per-credit rates for Brandman’s affordable online business degree. Students can sign up online for flexible payment options during enrollment windows in the spring and summer semesters. The BBA in management from UHD focuses on the development of critical problem-solving and team-building skillsets. Students are provided flexibility in customizing a management-specific plan of study, with course options including quantitative theory, organizational and group behavior, and project management. UHD provides a variety of degree plans, depending on a student’s status as a beginning or transfer student. Business students may be eligible for one of three types of scholarships available through the Davies College of Business and external donors. Students applying as freshmen will be required to complete some general education courses on the UHD or another college campus. Applicants with more than 15 qualifying college credits, who have earned at least a 2.0 GPA, are classified as transfer students. Residents of Massachusetts, Florida, Wyoming, Utah, Minnesota, Nevada, and Iowa are not eligible for this program. Bryan’s BBA includes 124 credits of coursework taught through a Christian lens. Courses are structured in accelerated, six-week terms, with new classes starting every six weeks. Students are challenged to apply new content each week through real-world activities or within an existing professional role. Learners beginning the program with more than 48 credits will take a blend of core business, general education, and major or elective courses. Credit can be earned for prior professional or military experience, as well as through completion of the Tennessee Transfer Pathway, which requires the completion of an associate degree at a local community college. Bryan’s business degree online offers a choice of four specializations: healthcare management, resource management, human resources, and leadership. Graduates are able to identify best practices within a range of business domains, develop real-world solutions through critical analysis and application of business principles, and implement communication campaigns that integrate multiple channels within an organization.